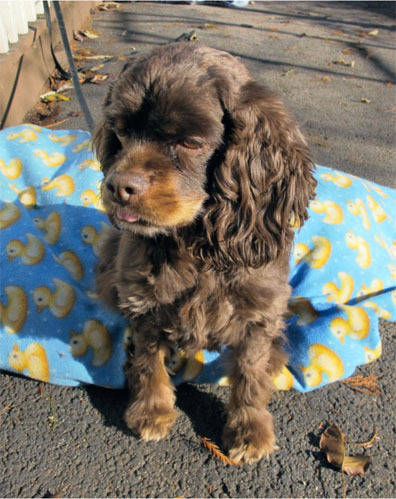 Hallie [Adopted Jan 2015] is a female chocolate and tan cocker. Her previous owner passed away. Since she is only two, she still has her puppy energy. She is housetrained, however she is still learning to communicate needing to go out, so right now I take her out on a leash several times a day. She likes to chase squirrels and birds so a fenced yard is needed for her safety. She tries to climb trees to get at them. A beginner obedience class will help her to be more mature. 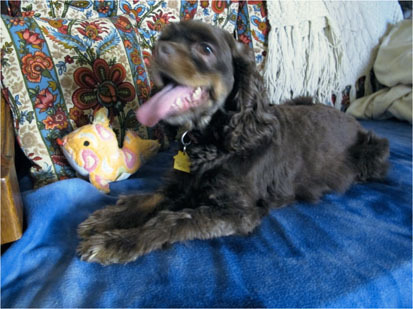 Hallie is very affectionate, likes to snuggle, and her little tail is always wagging. She is not aggressive toward my own cocker. She likes playing with her toys and with a tennis ball. She doesn't like being crated, but will settle down after a minute or two. She is quite vocal at first. I do crate her for the night. Please consider this cute little munchkin.